From I-35 North take exit 256B (5th Avenue West). At the lights turn right on Harbor Drive. The Aquarium parking lot will be on your right. Take Highway 61 to I-35 south. Exit at 256B. Follow signs for 5th Ave W veering to the right. Take a left onto 5th Ave W. The Aquarium parking lot will be on your right. Take Highway 53 North to I-35 North. Take exit 256B (5th Avenue West). At the lights turn right on Harbor Drive. The Aquarium parking lot will be on your right. Follow signs for Highway 53 South to I-35 North. Take Northbound I-35 to exit 256B. Follow signs for 5th Ave W veering to the right. Take a left onto 5th Ave W. The Aquarium parking lot will be on your right. NOTE: Construction continues on Interstate 35. This may impact those traveling to the Aquarium from south and east of Duluth. Visit the Minnesota Department of Transportation website for a complete list of projects and potential delays before you travel. The GLA, formerly known as the Lake Superior Center, is a freshwater aquarium that houses animals found within the Great Lakes Basin. It also houses animals from other freshwater ecosystems such as the Amazon river. Doors are locked at 6 p.m. and guests are welcome to stay until 7:00 p.m. Check out these freshwater fish! 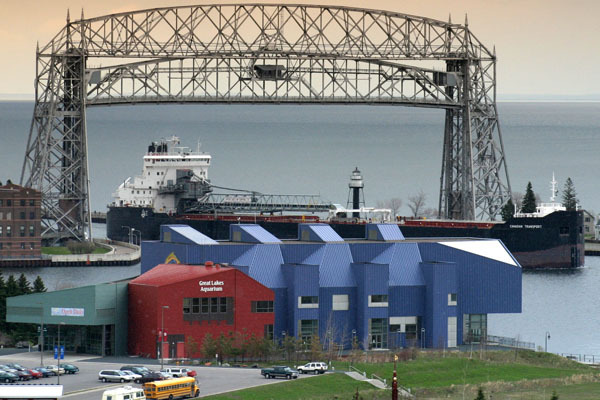 Whether you are a local or just visiting, be sure to check out the "Must See Duluth Pass" which includes admission to the aquarium, a Vista Fleet harbor cruise and a ride o the North Shore Scenic Railroad.